The Tennessee courtroom battle showed what can happen when big business joins forces with religious faith. Ironically, Six Days now reads like the Book of Revelations (which Darrow grandly mocked before, during, and after the trial). 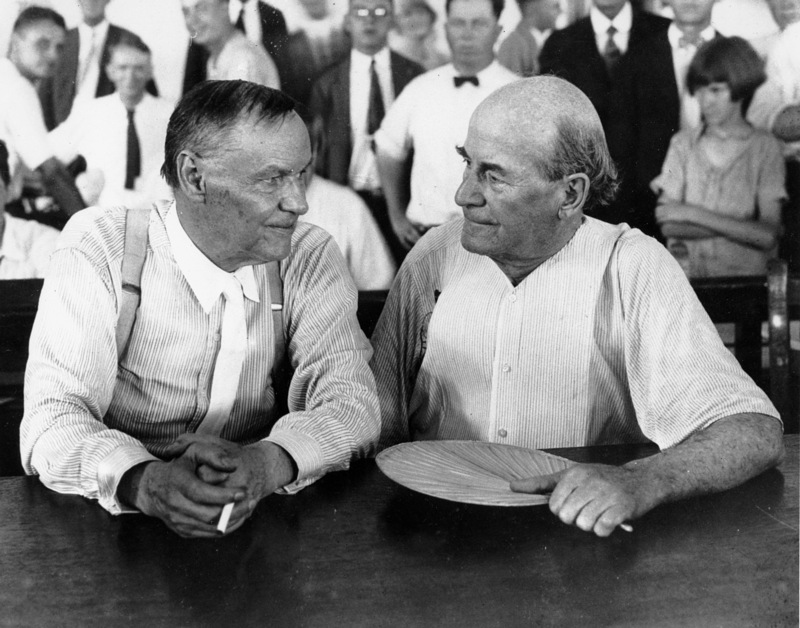 Indeed, it is revelatory to see how the forces that animated the run-up to the Scopes trial 90 years ago are still present today. We see their work mostly in the dogged renewal of the fight to teach creationism to our children and in the rancor over the truth about the human causes of global warming. To call these forces anti-science is accurate but not the entire story. It's something broader than that. In his introduction to Six Days, Ginger emphasized the role that recent immigration had played in reanimating fear-based practices and policies among white Americans. "The anxiety was nationwide, because some of the major causes were nationwide," he wrote. First, there had been the great European migration to America in the 1890s. "The new immigrant groups came to be voting blocs of more significance than were native-born Americans in one city after another," Ginger wrote. Present, too, with many, was a vague sense of guilt. ... The feeling of having sinned, of being on the verge of eternal damnation, was intolerable, and men had to assure themselves of their basic goodness. This effort required a simple definition of morality: a good man is a man who does not drink, or smoke, or gamble, or commit adultery, or contravene the Word of the Bible, and who punishes the sins of others. The big business groups and the fundamentalists likewise agreed that education should consist in the inculcation of received truths, not in the development among students of certain modes of analysis, not in the discovery of new truths. Truth is known. Teach it. Who knows it? We do. How do you learn it? The fundamentalists replied: God revealed it to us. The business groups replied: We are the elite. We know everything. Ginger distilled these attitudes. "A desperate flight backward to old certainties replaced the prewar belief in gradual adaptation to new conditions," he wrote. "In a convulsion of filiopiety, men tried to deny the present by asserting a fugitive and monastic virtue. Not progress, but stability and certainty." This dynamic helped explain, Ginger wrote, the new rise of fundamentalism as a political force. It accounted for great skepticism of the new truths of science. And it generated the rise in nativism and xenophobia that gripped the nation during that time as well as the restrictive immigration policies that resulted from it. There is evidence all around that the same thing is happening today. We have a new generation of fear and prejudice wrought by a new wave of immigration. We have a new wave of weariness of war after two more bloody conflicts. And we have a new wave of skepticism about science that has manifested itself in two distinct ways. Nearly 90 years after the Scopes trial, there are still anti-evolution forces pushing to include creationism in our public schools And nearly 90 years after the Monkey trial corporate forces still are pushing back against science, still promoting the "inculcation of received truths." The Tennessee law that started it all was called the Butler Act, named after an earnest, well-meaning lawmaker named John Washington Butler who drafted the statute after he heard a story, from a traveling preacher, about a young woman who had gone to college and come back believing in evolution. Why did Butler do it? "In the first place," he said later, "the Bible is the foundation upon which our American Government is built. ... The evolutionist who denies the Biblical story of creation, as well as other Biblical accounts, cannot be a Christian. It goes hand in hand with Modernism, makes Jesus Christ a fakir, robs the Christian of his hope and undermines the foundation of our Government." ...it shall be unlawful for any teacher in any of the Universities, Normals and all other public schools of the State which are supported in whole or in part by the public school funds of the State, to teach any theory that denies the story of the Divine Creation of man as taught in the Bible, and to teach instead that man has descended from a lower order of animals. One is a nutritionist who believes "creation science" based on biblical principles should be taught in the classroom. Another is a chemical engineer who is listed as a "Darwin Skeptic" on the Web site of the Creation Science Hall of Fame. A third is a trained biologist who also happens to be a fellow of the Discovery Institute, the Seattle-based center of the intelligent-design movement and a vice president at an evangelical ministry in Plano, Tex. As Texas gears up to select biology textbooks for use by high school students over the next decade, the panel responsible for reviewing submissions from publishers has stirred controversy because a number of its members do not accept evolution and climate change as scientific truth.... Six of them are known to reject evolution. Texas is not the only state where creationism is seeking to make a return to public policy. This year, Oklahoma flirted with an anti-evolution measure -- it passed out of Committee but died without a vote in the legislature. Last year, Alabama went down the same path. The year before that, in 2011, Florida mulled over the concept. "Why do we still have apes if we came from them?" asked state Sen. Stephen Wise. And in Tennessee itself, the scene of Darrow's destruction of Bryan, creationism again may be taught in public classrooms (alongside evolution) thanks to a law passed largely by Republicans in 2012. Thus Byran -- a man who never his entire life dissected animal flesh until it was cooked -- could reach conclusions about physiology contrary to the conclusions of all physiologists. "Anatomy presents convincing evidence that man's body was designed by an Infinite Intelligence and carefully adapted work required of him. ... All his parts show that man is not a haphazard development of chance, but a creation, designed for a purpose." To the Creationists of the day, Ginger wrote, "[t]ruth revealed in the Bible could not conflict with truth discovered by science. All truth was from God. But what if they seemed to conflict? The answer was easy: The truth that science claimed to discover had not been discovered at all. It was not truth, but wild guesses." Is that not the gravamen of the argument made today by corporate climate change skeptics? Not that science can never give us the answer about global warming -- even the US Chamber of Commerce won't go that far -- but that the answers it has given us so far are wild guesses dressed up as scientific proof? Is climate change education the new evolution, threatened in U.S. school districts and state eduction standards by well-organized interest groups? A growing number of education advocates believe so, and yesterday, the National Center for Science Education (NCSE) in Oakland, California, which fights the teaching of creationism, announced that it's going to take on climate change denial as well. "It's not like we're bored," says NCSE Director Eugenie Scott: Five state bills that would allow teaching intelligent design in schools have already surfaced in 2012. But after hearing an increasing number of anecdotes about K-12 teachers being challenged about how they taught climate science to their students, she says she began to see "parallels" between the two debates --namely, an ideological drive from pressure groups to "teach the controversy" where no scientific controversy exists. NCSE expects this task to be much harder than fighting creationism. "The forces arrayed against climate science are more numerous and much better funded," Scott says, and are better able to get their message across in the mainstream media than creationism supporters. Organizations such as the Heartland Institute, which questions whether humans cause climate change, send out free educational materials to teachers and school boards. As Science reported in September, teachers who already struggle with small science budgets and little time for teaching have no time to fend off ideological attacks from students, parents, and administrators. Scott says that one of NCSE's tasks will be to analyze these materials and educate teachers on why they are scientifically unsound. NSTA's survey found that many teachers feel unprepared for global warming skepticism because of a lack of teaching tools. Last week, a much-anticipated United Nations' report concluded there is "unequivocal" evidence of climate change and that humans are "extremely likely" to be the cause of global warming. "Human influence on the climate is clear," the report says. What did the Heartland Institute think of the UN report? Not surprisingly, not much. From its website: "IPCC reports are notorious for citing environmental activist memos and other unreliable sources to support alarmist climate assertions..." And so onward rages the battle for the soul of science. "Science has explained everything it could explain and will continue to do so," Ginger wrote 55 years ago as he was wrapping up his book. "Every effort to bar science from some areas on the ground that they were not susceptible to empirical investigation has had the effect of inhibiting science in other areas. Man has progressed by exercising a humble confidence in the might of his own mind, not by throwing up his hands and shrugging his shoulders." Throwing up his hands and shrugging his shoulders. Fear is the great underlying theme of Ginger's work, and it seems to me that fear helps explains the forces at work today, in Texas and elsewhere. Fear of great social change animates a longing for the "old certainty" of creationism. Fear of the great economic change it will take to combat global warming animates the denial of global warming. And fear of the new truths, as expressed in science, animates the suspicion of it. This is part of the fundamental conservatism that has almost always marked America's political profile. Reading Ginger's narrative half a century after he wrote it is a reminder that America is rarely at its best when it is motivated by fear or when it has constricted, rather than expanded, its field of knowledge. The book also a reminder, as if we needed one, that some political battles are never won for good; that they have to be re-fought over and over again, from one generation to the next. Nearly a century after Scopes, the battle over evolution evidently still lingers. We all should shudder to think where we all will be if, a century from now, the battle over global warming remains equally unresolved. * I won't recite here all of the fascinating components of the Scopes trial. If you are interested in it, or in the life and times of Darrow more generally, find and read Six Days, or John Aloyious Farrell's excellent Attorney For the Damned, or Randall Tietjen's epic collection of Darrow's letters, In the Clutches of the Law, which every law student should receive as a gift from a parent or guardian. Or, if you are lazy and do not want to read, just rent or download the great movie, Inherit the Wind, which is one of the great trial movies of all time.